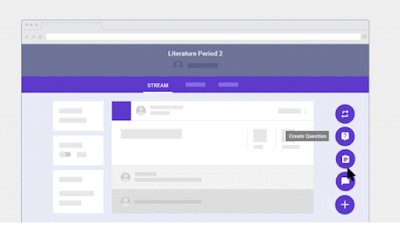 Google Classroom has recently introduced a new polling feature which enables teachers to create polls for a wide variety of educational purposes including comprehension check in class and feedback gathering. You can easily create single or multiple-choice question polls right in your class stream and see who have and haven’t answered your polls. Here is how to create a poll in Goole Classroom for the web. To learn more about how teachers are using this polling feature with their students, check out this post. ‘Sign in to Classroom at classroom.google.com. At the bottom, click Add Add and click Create question. Next to Due Tomorrow, click the Down arrow Down Arrow. To set a due time, click Time and type a time. 'To create a multiple-choice question, click the Down arrow Down Arrow at Short answer, and update to Multiple choice. At Option 1, enter the first answer option. Click Add option to add further answer choices. Add as many options as you wish. Optional) To delete an option, click X. Check out Google Classroom Help Centre to learn more.